Fenzi Dog Sports Academy - EasyBlog - PODCAST E99: Leslie Eide - "Canine Fitness with Cavalettis"
Today we're talking to Dr. Leslie Eide. Leslie graduated from Colorado State University's Veterinary School in 2006. She completed a rotating internship in small animal medicine in Albuquerque, NM, then became certified in canine rehabilitation with a focus in sports medicine. She is now a resident with the American College of Veterinary Sports Medicine and Rehabilitation. Leslie is involved in the agility world; she has trained two dogs to their Agility Dog Champion title — their ADCH — and one to ADCH Bronze, an Agility Trial Champion title and a Master Agility Champion title. Multiple dogs have qualified for Cynosports, ASCA Agility Finals, and AKC Nationals. In 2017, she competed with Stig at the European Open Tryouts. Most recently she competed with Ghost and Stig at the UKI US Open, where both dogs had Top Ten placements. And today, she's here to talk to us about fitness and our dogs. Welcome back to the podcast, Leslie! Leslie Eide: Thanks, Melissa. I'm really excited to be here today. Melissa Breau: To start us out, can you just remind listeners a little bit about the dogs you have now, who they are, and what you're working on with them? Leslie Eide: I have four dogs that I claim as my own. I have Brink, who's a 12-year-old Border Collie, and he's basically enjoying the retirement life. Often I'll say he's champion of the practice jump or the tunnel. So he gets to run around and go on walks, but no official sports training at this time. Next I have Stig, a 7-year-old Border Collie, who's still one of my primary competition dogs with agility. He's still competing at a championship level and traveling all over with me to compete at nationals and local trials. And then Ghost is the token Australian Shepherd. She's 5 years old and again my main competition dog right now in agility, and she's up-and-coming, so the UKI US Open was her first Nationals. So now I'm looking for doing bigger and better things with her. And then I have a puppy who is … gosh, I never remember. He's 10-and-a-half months old now. His name is Watson and he's a Border Collie. He's still just learning the fun stuff, so a lot of focus on just being able to live life happily with a pack of dogs, with the house and work schedules. We're just starting, at 10-and-a-half months old, to introduce him to some foundation agility training. Melissa Breau: Awesome. Congrats on the recent UKI stuff. That's awesome. Melissa Breau: What came first, the interest in dog sports or the interest in veterinary medicine? How did you wind up focusing in sports medicine? Leslie Eide: That's a really good question and I've never had anyone ask me that way before. It really made me think, and honestly, the answer is dog sports first, before veterinary medicine. About a month to go in my swimming career at university, I realized, "Oh my god, my swimming life is ending. I can get a dog" First thing I knew I was going to do with that dog was I knew it was going to have to be better trained than any of the dogs I grew up with — sorry, Mom and Dad — but that was my first goal in getting a dog. And my second goal was "I really want to do agility with it." I think I'd probably seen agility on Animal Planet and was like, "Oh, I really want a dog to do that with." And so I left one sport that was just me, with swimming, and then could focus on developing my skills for a new sport. Around the same time I also realized — because this would have been spring semester of my senior year at university — it dawned on me: I'm going to graduate, and then I have to do something with my life, and I don't really know what I'm going to do. Swimming was my life, so my undergraduate degrees were in economics and European studies, and that doesn't really bode well to a single profession. I didn't want to necessarily go into academia or, God forbid, politics, so I was like, "What can I do with an economics degree? I don't know." Someone was like, "Well, you're so good with your puppy. Why don't you become a vet?" And I was like, "OK, I'll do that." So that's literally how I got on the road to veterinary medicine. So definitely dog sports came first, veterinary medicine second. The focus on sports medicine was also a similar story. 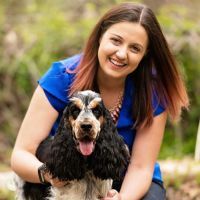 My initial interest in going to veterinary school was to become a behaviorist, and I made it all the way through my internships thinking that that was what I wanted to do. In my internship again it dawned on me that that's going to be a really hard career path even in veterinary medicine, especially with my situation, where if I went from my internship to a residency there were a whole bunch of other loops I would have to jump through to actually be able to become a behaviorist. My surgeon mentor during my internship said, "There's this whole new field of sports medicine and rehab coming up. You already do sports with your dogs, you know more about it than I even know about it, so maybe you should look into that." He showed me all the resources that were out there and gave me the first textbook, and that started me on the path. It just was a nice fit because it does definitely have an aspect of behavior and dog training, but you still get to do the diagnostic part and the challenging part of figuring out what's going on with the dog and coming up with a treatment plan for it. Melissa Breau: … and ask if you can share a little bit about what you're working on. Leslie Eide: I think I can share a little bit about it. I don't think I'm supposed to talk a whole bunch about it, because part of the award was that I had to present my findings at a big conference in 2021. But the question I've been working on for my entire residency is how does strength conditioning affect performance. Everything that I teach, and teach at Fenzi with Jumping Gymnastics and now the cavalettis, is really looking at strength conditioning and can we say does this fitness program improve the dog's performance. Specifically for this grant I did have to change my model. I really, really wanted agility to be my model — I'm sure you can guess why: I really like agility — but agility is not a good model for measuring performance, so I did switch to flyball. So we're going to be measuring flyball performance to see if there's improvement with dogs that start a conditioning program. Melissa Breau: Interesting. I'll have to have you back on once you have done your big talk on it and can share the results and get into it a little more. Melissa Breau: So, I was hoping we could talk about your cavaletti class that you mentioned. To start us out, for anyone not familiar with dog fitness stuff, can you just briefly explain what cavalettis are? Leslie Eide: Cavaletti — it's a great word, a fun word to say, it comes from Italian, I think, for "little horse," so everything we talk about cavalettis completely comes from the horse world. The definition there is the rails that can be adjusted height-wise and space-wise. Traditionally there's three different heights that you can set them at in the setups for horses. They're meant to help the horse understand its stride length, and increase strength in the horse, and improve body awareness. We basically stole that idea and moved it over to the dog world. So, to me, if someone says "cavalettis," what I picture in my mind is rails that are held up by some kind of standard on each end, and I can adjust both the height and the distance between rails. Melissa Breau: For most people that looks like poles and cones, right? Leslie Eide: Yeah, most commercial sets are poles and cones. It's just an easy way to do it. You can take a cone and put holes in it and then have some PVC that goes in the hole from cone to cone. Melissa Breau: Of all the types of equipment out there and types of exercises, why cavalettis to create a class around? Leslie Eide: I think it's one of the hardest pieces of equipment for people to come up with ideas. Looking at Jumping Gymnastics for that kind of example, I use all kinds of different fitness equipment for it. But in the very first class I did have cavalettis as trotting rails as the very first assignment. People did struggle with getting their dog to understand it, and sometimes it would take a large portion of the class. And then more and more questions started popping up about "How do I do this? How do I teach my dog to do this?" And I was like, "I think that makes for a good class to be able to teach that." I've had fairly good success getting lots of dogs to do that, especially since I use it in rehab on a day-to-day basis. But also I wanted a class that I could help people think outside the box and think of other ways to use that equipment, so it's not like you're getting this piece of equipment and you only have one use for it. I want you to be able to plan a whole fitness program around just this single piece. Melissa Breau: That's so cool, because I feel like a lot of the equipment does take up space and it's a little on the bulky side, and it's such a neat piece of equipment that can be packed away in a relatively small space and fit in a closet and whatever else. Melissa Breau: What kind of dogs can benefit from the exercises in the class? Are there specific types of sports or types of competition that they're most beneficial for? What are the benefits of this stuff? Leslie Eide: I really think this can be a universal class. I think it can benefit all ranges of dogs, whether you're not doing any sports or you're a high-level agility dog. I look at it as a lot of the exercises can be very low intensity and low impact, but we can make modifications to them and suddenly they become a little bit more high-intensity exercises. Specifically, I think when I want to use cavalettis, my goals for the exercise are things like improving body awareness, improving flexibility, and then I can also use it if strength is my goal. I just have to make some changes to my setup. And then definitely I can also use it as a cardio exercise where I don't actually have to do so much cardio with my dog. That's always the hard part about getting your dog to do cardio. When they say, "Take them for a run," that usually means the person has to run with them as well. But cavalettis we can kind of get around that a little bit. Melissa Breau: That's pretty neat. For those who are familiar with cavalettis and are probably used to the idea of dogs trotting across them, I know you're going well beyond that in this class. Can you share one or two examples of the other ways you'll be using them and teaching the people to handle the dogs using them, I guess, in this class? Leslie Eide: We're definitely going to have some jumping exercises in there, and crawling, and combinations of exercises, so different movement patterns of not just doing it straight but also "Let's work on doing it in a circle or a Figure-8." Hopefully lots of variety, and we'll also help the students think of new exercises on their own that they can do with the equipment. Leslie Eide: We're definitely going to talk about some tips on how to train it and how to train your eye so you can see what kind of adjustment needs to be made to how you set it up. That's one of the hardest things with cavalettis is that there is a basic formula you can start with, but really no dog reads the textbook and fits exactly in the formula. So you can start with that formula, but then you usually have to usually make adjustments to the spacing or the height to better fit your dog. And then once you have that figured out, how do you change the rails to continue to challenge them. But I'm also going to drop in a little bit of training tips, like using markers to help your dog know where the reinforcement is coming. That fits in really well with the cavalettis, because a lot of times we don't want them looking at us during the exercise. We need to have their focus somewhere else. So talking about that, and then definitely each assignment or exercise will have a little description of what the purpose of this exercise is, like, why would you choose to do it. Melissa Breau: If listeners are thinking about signing up, can you share a little about who might be a good fit for the class? What do they or their dog need to know going in? Leslie Eide: I think this is a class that there's not a lot of required pre-knowledge. I try to plan it out so we start with the easy stuff first and build off that. So your dog can start out, even if it has to be on leash, we can make that work. Knowing how to walk with you, I guess, is the biggest requirement. That's where we start, and we build off of that. It's easy to make adjustments, so if your dog is new to fitness, I think this is a great place to start. It can be very low impact, low intensity. But if your dog has been doing fitness and you're just looking for some more ideas of things that you can fit to your program, this is a great place to get ideas and modifications to add some excitement to your fitness program. Melissa Breau: It sounds like a great class. Leslie Eide: Yeah, I'm really looking forward to it. Melissa Breau: So, one last question here: What's a lesson you've learned or been reminded of recently when it comes to dogs? Leslie Eide: This is one of my favorite questions of yours. It always makes me think, because I'm not good about thinking back and being like, "Oh, what's a lesson?" I'm constantly reminded that I need to be better about keeping data, writing things down of what we need to work on, what our results were after a training session. But the other thing that I was just reminded of this past weekend was letting the dog tell you when they're ready for the next step, when they're ready for the next challenge. That comes from fitness, of interpreting — even if we use the cavaletti class as an example — once they can trot through the rails or the poles without looking at me, looking straight ahead, basically telling me that they understand that behavior, now I know they're ready for the next challenge. Melissa Breau: Awesome. Thank you so much for coming back on the podcast Leslie! This has been good. Leslie Eide: Thanks for having me. I'm really excited to start teaching this class and I hope people are excited to take it. Melissa Breau: It certainly seems like it. There was a good buzz going on on the alumni list, so it's good stuff. Melissa Breau: Thank you to all of our listeners for tuning in! We'll be back next week, this time with Loretta Mueller to talk about training agility in small spaces. If you haven't already, subscribe to our podcast in iTunes or the podcast app of your choice to have our next episode automatically downloaded to your phone as soon as it becomes available.